And this saying is accompanied by a nice and beautiful house. It would be nice if I could marry someone who can build me a house that we can share forever. BUT ANYWAAAAYYYY, this post is brought about my recent visit to IKEA. 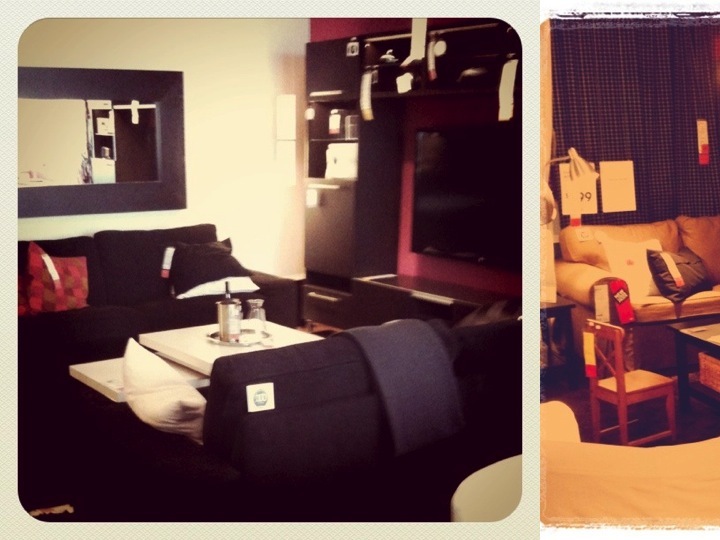 IKEA is a Swedish furniture shop which was like heaven for those who wanted cheap finds for their house. Their vision is to “create a better everyday life for the many people”. In my stay here in Canada for over a year now, last Thursday was the first time I have been to the place. They had a showroom that presents different kinds of house set ups and designs depending on the needs, civil status, materials, etc. But the price is affordable relatively. I took some pictures of some set ups using my instagram — an iPhone application which I recently found out about. You should give it a try. So all day I had dreamt of having a beautiful house someday with a lot of instalments from IKEA. If you can’t still picture what IKEA is, try clicking here. This is a scene from 500 days of Summer when Tom and Summer had a trip to IKEA. But most important part of the trip was the food. Yes you heard it, they had food there inside the furniture shop! I have never been to a two place in one kind of store. So I was happy. It was the first time. I went with David and Josh and I shopped for light bulbs which was a fail by the way. Both David and Josh went looking for a desktop lamp. They were successful. We went to eat too and it was very cheap and I wasn’t able to finish it. I went for the organic pasta and crepes. So here’s their menu and no, I am not advertising them. I just fell in love with IKEA and I want more trips to IKEA. Talking about home, I love my home even when I am not in the city city of Canada. I live in Mississauga. It is close to Toronto where most of the high end events happen and though I would want to move there someday maybe on my own with my cute little flat, Mississauga is a quiet place to be in, I am glad that I live here with my family. Also I recently came from London part of Canada. It is more of the country side. There are no Filipinos or Asians there, maybe there are but barely. The place is just so depressing though they have lakes and what not I would not want to live there, it is too boring for my taste. I went there for my friend’s birthday weekend celebration. We hit Pinery beach and reached Up on Carling club. It was a nice experience only because it was with my friends. But the best home will always be the one and only Philippines. And I can’t wait for the day to come that I can finally say that I am coming home — the home that holds my heart. It is where my heart is. This entry was posted in Canada and tagged communication studies, ericka mercado, home, ikea, london, mississauga, philippines, pinery, up on carling, york university. Bookmark the permalink.